I recently threw a rich, Beef Bourguignon dinner party and wanted to start with a flavorful, texture-full roasted Brussels sprout salad with a few surprises. 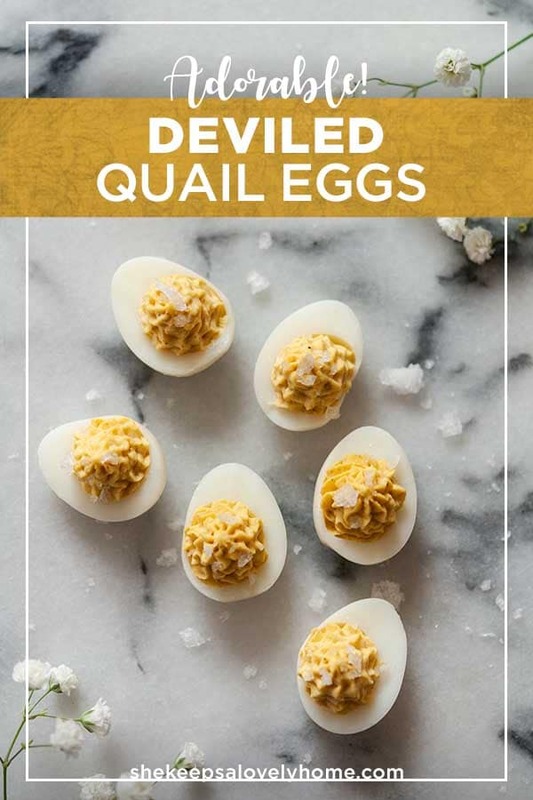 I topped it with these precious deviled quail eggs and sprinkled them with just a tiny bit of flake salt. It may have been the prettiest little salad I’ve ever served at a dinner party! Any eggs that are fresh off the farm will simply not peel, whether they’re chicken eggs or quail eggs. The membrane between the shell, yoke and egg white is just too sturdy when they’re very fresh, so it won’t easily come loose without taking a good amount of the egg white with it. I find the most ideal egg-peeling time is about a week away from its expiration date. 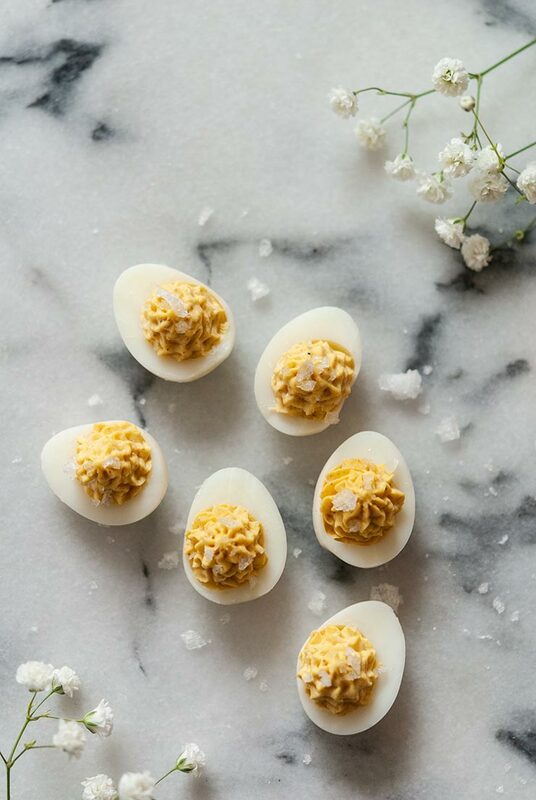 The quail egg yokes are so tiny that you may find that just the amount left in a pastry piping tip will make it tricky to fill each egg with enough to look nice. For good measure, add 2 chicken egg yokes to your filling to make sure you have more than enough to really pipe them nice and full. Some people roll their eggs on a hard surface before peeling them to crack the shell, but I find this adds too many dents and imperfections to the egg white. I highly suggest simply tapping them gently around the center, putting them under running water to help separate the membrane from the egg, and gently peeling the shell away. 1. How long do they take to make? They take just 17 minutes in the pot, 10 minutes to peel and 10 minutes to mix your filling and serve. 2. How do you make them ahead of time? Follow the recipe and place the little cut egg whites in a sealable container in the refrigerator. Place your pastry piping tip in a pastry bag and use a twisty tie to seal the bag just above the tip. Spoon your filling into the bag, then seal the other end as well with a twisty tie and refrigerate. 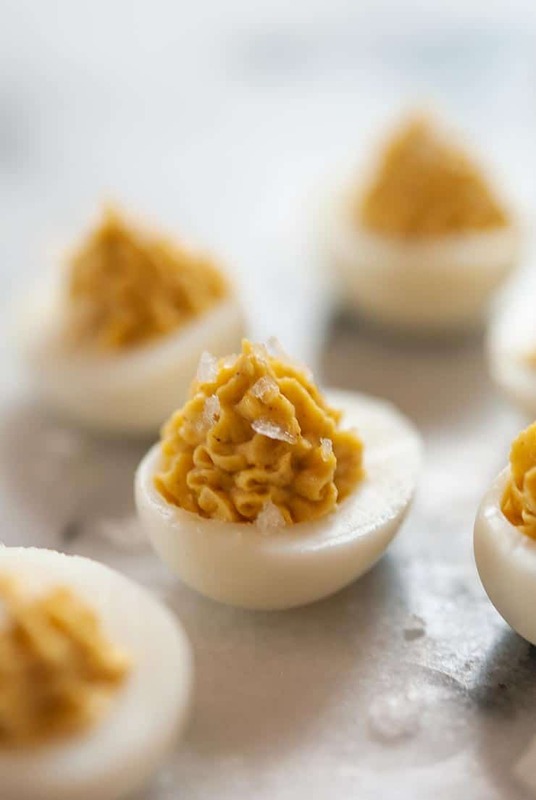 When you’re ready to serve your eggs, simply take your egg whites out of their sealed container and remove the twisty-tie from the bottom of the piping bag to fill your eggs. 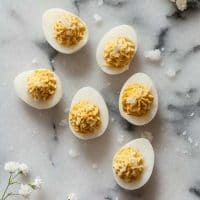 You can make the eggs and filling a whole 24 hours ahead of time, but don’t fill them until a half hour before serving, at most! They will begin to dry out shortly after filling. You can either do step 1 and 2 simultaneously if you have 2 pots, or one at a time. 1. Hard boil 2 large chicken eggs (to add the yokes to your quail egg filling later). Place them in cool water in a pot and turn on medium heat. Allow them to sit for 20 minutes, then remove them from the pot and place them in a bowl of cold water for 10 minutes (or until your quail eggs are boiled, peeled and ready). 2. Place 9 quail eggs in cool water in a pot. Bring the pot to a boil (about 5 minutes). As soon as the water has come to a boil, remove them from heat and let them sit in the hot water for 12 minutes. Remove them from the water and place them in a bowl of cold water for 5 minutes. 3. 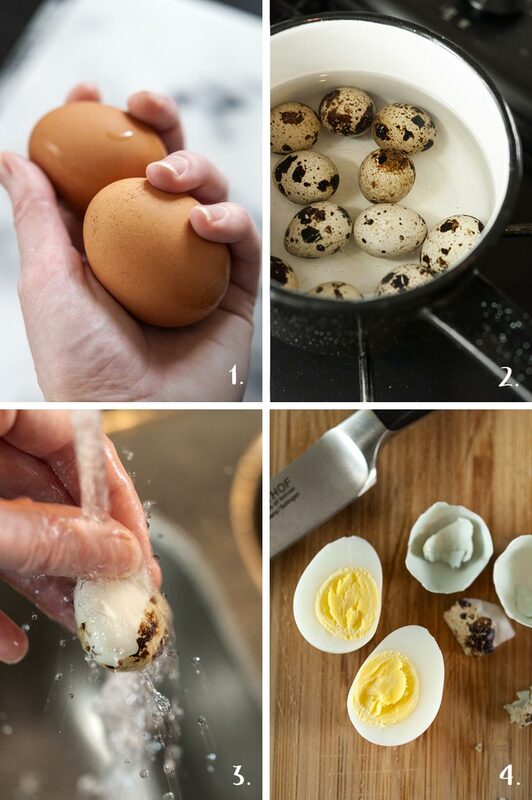 To easily peel the quail eggs, tap them around the center with a paring knife and place them under cool running water. This will help to separate the membrane from between the egg and the shell. Simply peel the shell away. 4. 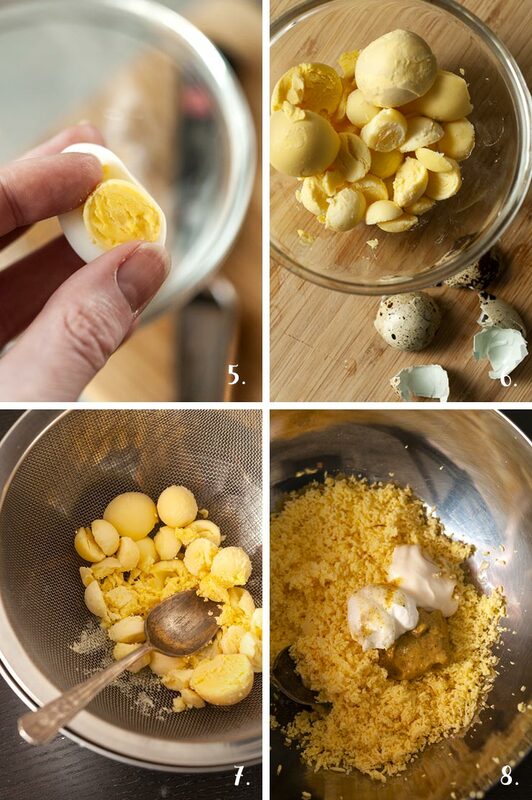 With a thin, sharp paring knife, carefully slice the quail eggs in half. 5. Remove the yokes. They will gently slide out if you simply loosen them a little from the egg white. 6. Crack open your 2 chicken eggs and remove the yokes and add them to your quail yokes. Discard the whites. 7. To ensure your filling is creamy, add all of the yokes to a mesh strainer over a mixing bowl and push them through with a spoon before you mix in your other ingredients. 8. To your mixing bowl, add 2½ tsp. of spicy brown mustard, 2 tsp. sour cream, 2 tsp. mayo and give it a tiny sprinkle of salt, pepper and Old Bay seasoning (optional). Mix thoroughly. Add the filling to your pastry piping bag and fill your pretty little eggs! 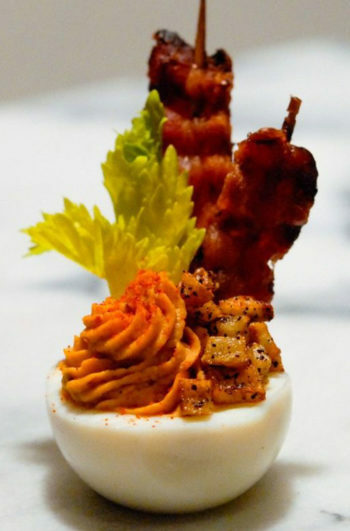 Garnish with a little flake salt to give them an exciting texture and serve! NOTE: You want your filling to be the consistency of hummus, and this recipe is purposely on the dry side so you can tailor the flavor to your liking. Give your filling a little taste, and see if it could use more of either the mustard, mayo or sour cream to get it to the perfect flavor and consistency. Hard boil 2 large chicken eggs (to add the yokes to your quail egg filling later). Place them in cool water in a pot and turn on medium heat. Allow them to sit for 20 minutes, then remove them from the pot and place them in a bowl of cold water for 10 minutes. (or until your quail eggs are boiled, peeled and ready). Place 12 quail eggs in cool water in a pot. Bring the pot to a boil (about 5 minutes). As soon as the water has come to a boil, remove them from heat and let them sit in the water for 12 minutes. Remove them from the hot water and place them in a bowl of cold water for 5 minutes. 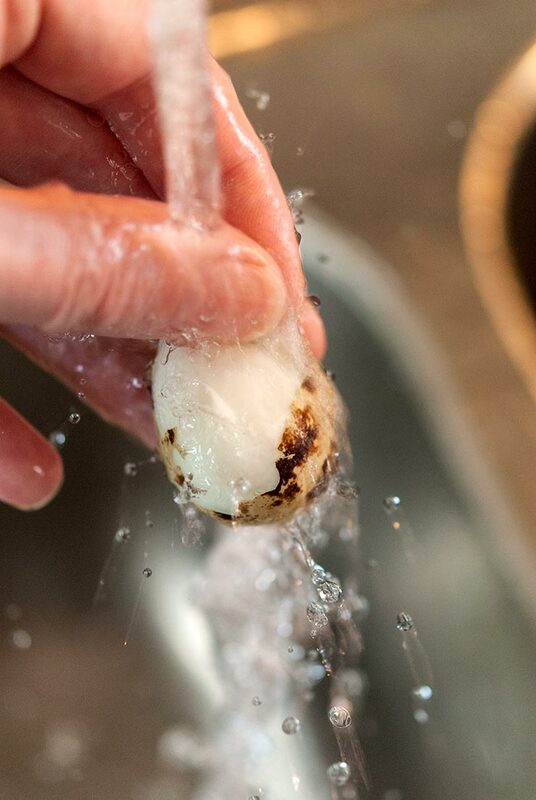 To easily peel the quail eggs, tap them around the center with a paring knife and place them under cool running water. This will help to separate the membrane from between the egg and the shell. Simply peel the shell away. 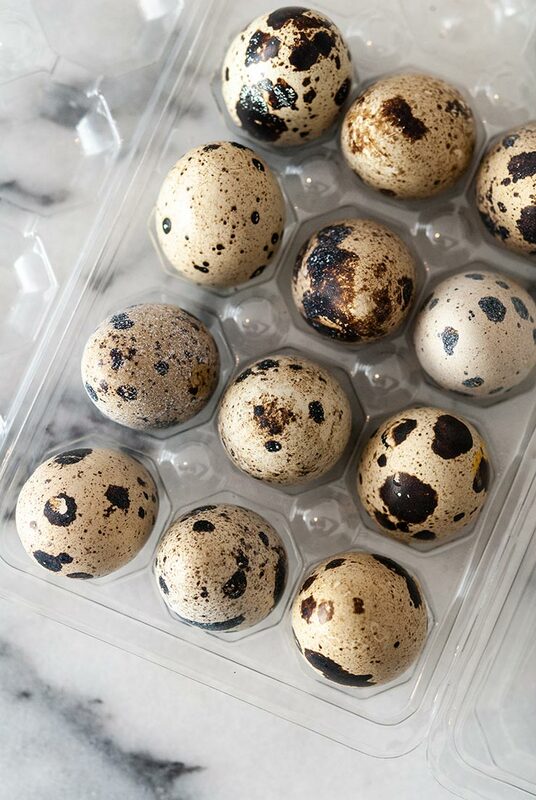 With a thin, sharp paring knife, carefully slice the quail eggs in half and remove the yokes. They will gently slide out if you simply loosen them a little bit from the egg white. Crack open your 2 chicken eggs and remove the yokes. Discard the whites. 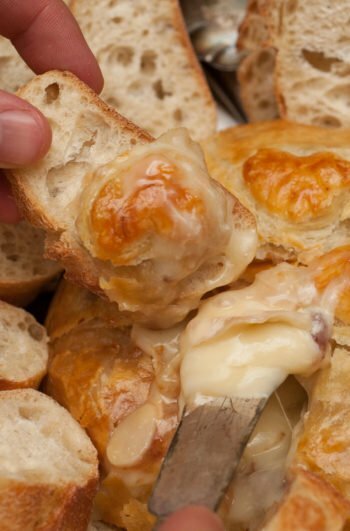 To ensure your filling is dreamily creamy, add all of the yokes to a mesh strainer over a mixing bowl and push them through with a spoon before you mix in your other ingredients. To your mixing bowl, add 2½ tsp. of spicy brown mustard, 2 tsp. sour cream, 2 tsp. mayo, and give it a tiny sprinkle of salt, pepper and Old Bay seasoning (optional). Mix thoroughly. Add the filling to your pastry piping bag and fill your pretty little eggs! Garnish with a little flake salt to give them an exciting texture and serve. pastry piping bag and small tip. 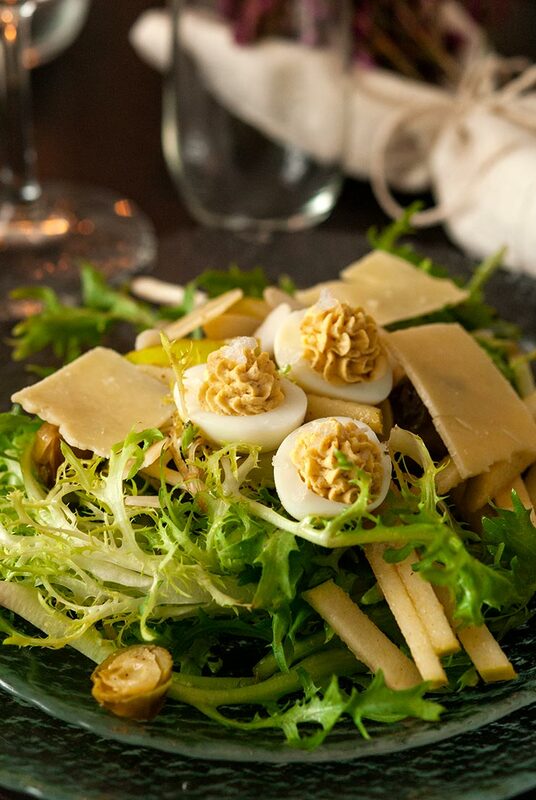 "Cook Time" for this recipe is based on the boiling time of the quail eggs. The cook time for chicken eggs is 20 minutes, as noted in the recipe.